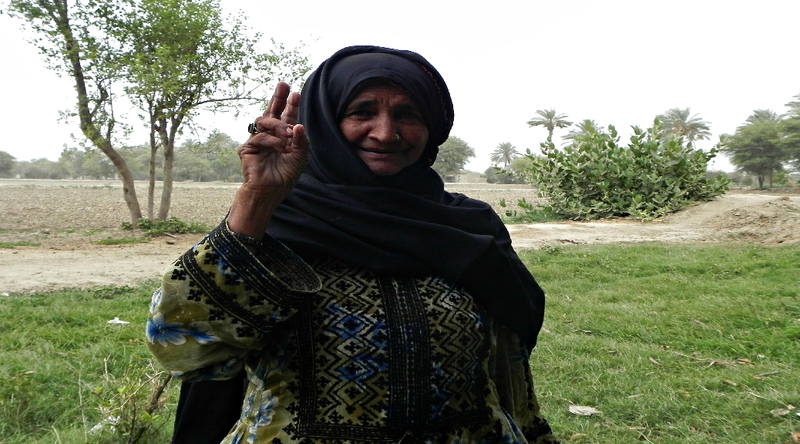 Rehmat Khatoon belongs to the Siyan Community of Baloch tribe. About 55 years ago, she was born in the home of active social leader Noor Mohammad Siyan, in the vicinal village Goth Qadwani of Kandacha Valpet situated at the 30 km distance from historical city Bela of district Lasbella. After her father’s demise, Rehmat khatoon was aggressive to move forward the values of her forefathers and mission of her father. She is committed to alive the mission and character of his father in the society and decided to strive and work hard for her people. The society in which Rehmat Khatoon opened her eyes is a traditional and tribal society where there was dominancy of feudalism and backwardness. But, Rehmat Khatoon, a positive thinker and promoter of development, accepted this challenge while living in the outdated traditional society. Rehmat Khatoon gave birth to seven children after her marriage but she took care well of her home , relatives and family in addition to welfare services at social level for people of her community. She thought that in the backward society where people are deprived of basic necessities of life, no change will occur in the life of villagers nor will the fruits of development reach to the people if we silently accept the backwardness as our fate. In this traditional society, Rehmat Khatoon, who worked as an active political and social worker, faced a lot of difficulties. She also faced the problems like social differences, disputes and internal conflicts. Her family encountered heaps of problems, children faced a lot of difficulties, and some people of her family and her elder son also get imprisoned. Despite of internal issues and problems she did not give up her social activities. She fought the problems like a man. She had only 2 acres of hereditary agricultural land available for livelihood. She worked and labored with her children on this agricultural land for livelihood. This agricultural land is cultivated through water of Siyan of Porali in which she harvested and planted the millets, peanuts and guar like crops for survival. She continues to openly denounce and condemn the mutual disputes, backwardness and exploitation in her nearest communities. She still appears to continuously inform the concerned people with her capacity about the basic problems of people. According to Rehmat Khatoon, she had seen the poverty, starvation and thirst closely which are tightly knot with her for 55 years to no more afraid her. She is the religious women who keeps her trust in God and believe on hard work and labour. She also faced some natural disasters. Mostly due to floods and heavy rain, their farm fields has destroyed but during this she had also seen as a whole-hearted representative of people. She was successful in getting the aid for the people by connected with the government and non government institutions. Due to these activities Rehmat Khatoon got very fame in the whole region of Valpet. In the local Government election of 2007, she fought election on the general seat of women of Union Council Kathor and got 200 votes from the whole union and despite of all the conflicts, she won with a great margin. By considering the objective of deaths and complications in women during delivery, Rehmat Khatoon herself got training of midwife from the collaboration of non government institution of Sangat Lasbella, Peman and USAID. She has awarded the degree of TBA. Now she performs delivery cases in her village. As a lady councilor who played a very important role to get rid the people from Lake water and became successful in bringing the water scheme by the collaboration of H.E.D. For giving the ballot rights to the people of her territory, she helped the men and women in making more than 200 N.I.C’s by the collaboration of NADRA and doing efforts for the poor widows. She got successful in giving financial support to more than 50 women through Benazir Income Support program. By her efforts, there were three water tanks made in the area. about people’s problems and makes formal judgments. When she talks about marriages, divorce, land lording and water problems then people gives importance to her opinion. She is also playing an important role in settlement of murder controversy. She said as long as she alive she will continue to raise the voice for the basic rights of her people. Neither I bow down in front of Feudalism system nor would my people bow. Rehmat Khatoon still sees as an active worker with great commitment, courage and bravery. Her political opponents also have not been successful in reducing her fame. This time Rehmat Khatoon did not take participation in the local general body elections. Her opinion is that it only fills the seat of women but is not given importance and funds to them. Therefore she had decided to take herself away from the part of such system and committed to her work.